A safe, long-term solution to restore your winning smile. Dental implants are a great way to replace missing teeth rather than having a removable partial or bridge. 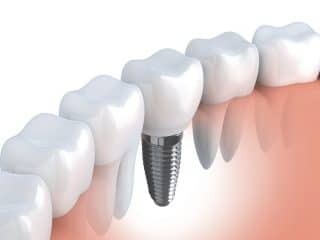 Dental implants are basically artificial roots (usually titanium) that are surgically placed in the area of the missing tooth, and then restored with an implant crown. Dental implant are very strong, durable, and stable and will last for many years. Winning Smiles offer dental implant service at Blacktown and Kellyville. One of the most popular and often in replacing missing teeth is the provision of dental implant. They’re an ideal way to replace a full set of teeth or just missing gaps, and will help ensure you have the perfect smile you want. There are many different types of dental implant which are available in the market, but at Winning Smiles, we only use implants that have been very well researched and are supported by successful companies. Mini-implants are smaller versions of a regularly sized implant, that is often used to anchor a denture. Anyone who has ever had to deal with the movement, inability to chew food, and embarrassment that a lower denture, or even an upper denture, can cause when it lifts up or looses it suction, will appreciate being able to snap their teeth into place.